6 x 2 x 37.5 g packs Chicken Entrée (two servings per pack). 6 x 2 x 37.5g packs Beef Entrée (two servings per pack). Total of 24 servings. 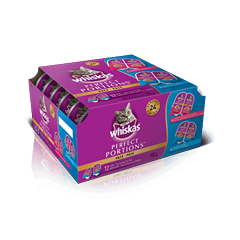 WHISKAS ® PERFECT PORTIONS™ MEATY SELECTIONS ® is rated 4.5 out of 5 by 66. Rated 4 out of 5 by SARAMON_351196785 from I really enjoyed the single portions, though I don't think that it was enough for our cat for one meal. She was constantly meowing for more food and she needed to be fed 3-4 times per day instead of 2. I liked the variety, although I don't think she necessarily cared. My only complaint is that the corner edge of the pate often stuck in the container, so to transfer it to a bowl for her required dirtying a knife, making it less convenient than the full size packages. Rated 5 out of 5 by DARLENECSK_351245394 from I would definitely recommend for someone to buy this multi-pack. It is very convenient to keep on hand with the variety of flavors. We all don't like eating the same thing all the time and my cat, Beans, I'm sure feels the same way. He did not leave any of the food, he ate the whole portion at one sitting. I have already bought another variety pack for him. Rated 3 out of 5 by SHARAYAHSK_351205314 from My cat is a fairly picky eater, even tho her main cat food is the hard Whiskas chicken food, she still refused to eat more than a mouthful of both the chicken and beef pates. Very thankful for the opportunity to sample for free so I didn't waste my money trying something new for this picky little cat! Rated 5 out of 5 by TEENADBC_351199306 from My cat loved it once she eventually got to try it. The problem was that the dog kept sneaking her food and ate the first 3 containers that I tried to feed the cat! My cat gets excited now when she sees what I'm bringing her. The dog, I might add, is truly disappointed that he no longer gets any. 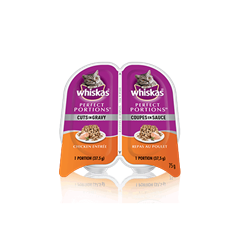 Rated 5 out of 5 by JENNIFERRBC_351233600 from Whiskas Perfect Portions are the only wet food I buy for my cats. I never have to throw any away like canned food which was always going to waste. My kitties absolutely love this food. They lick the bowl clean every time! It's convenient, well-priced and never goes to waste. It's a win-win-win! Rated 4 out of 5 by MONAWNL_351213736 from This product was very convenient and my cats really loved it. The only downside was what I felt was excessive packaging. If there was a way to reduce the packaging and/or make it more environmentally friendly, say, compostable packages that would be great. The price seems good as well. Rated 5 out of 5 by TIACON_351197994 from My cats seemed a bit apprehensive at the start as go what I was putting in front of them. They licked the jelly and slowly started eating but didn't finish all of it. By the third day however they were visibly excited and ate the entire portion! Will purchase again. Thank you! 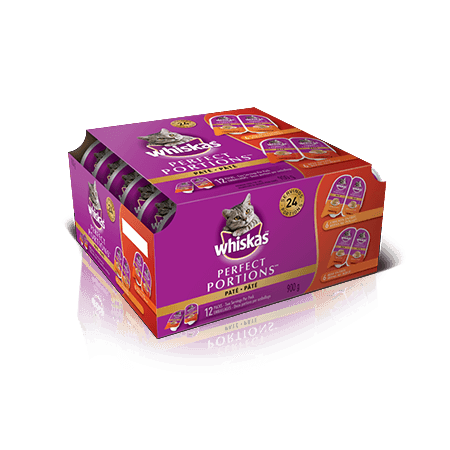 WHISKAS® PERFECT PORTIONS™ MEATY SELECTIONS Chicken Entrée: LIVER, CHICKEN, MEAT BY-PRODUCTS, CHICKEN BY-PRODUCTS, NATURAL FLAVOURS, CALCIUM CARBONATE, SODIUM TRIPOLYPHOSPHATE, GUMS, COLOUR, MINERALS, DRIED YAM, METHIONINE, DEXTROSE, SALT, D-XYLOSE, L-CYSTEINE, VITAMINS, ERYTHORBIC ACID, GLYCINE, TAURINE, SODIUM NITRITE, SUFFICIENT WATER FOR PROCESSING. 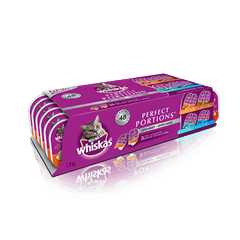 WHISKAS® PERFECT PORTIONS™ MEATY SELECTIONS Beef Entrée: LIVER, MEAT BY-PRODUCTS, CHICKEN BY-PRODUCTS, CHICKEN, BEEF, NATURAL FLAVOURS, CALCIUM CARBONATE, COLOUR, SODIUM TRIPOLYPHOSPHATE, GUMS, MINERALS, DRIED YAM, METHIONINE, DEXTROSE, SALT, D-XYLOSE, L-CYSTEINE, VITAMINS, ERYTHORBIC ACID, GLYCINE, TAURINE, SODIUM NITRITE, SUFFICIENT WATER FOR PROCESSING. WHISKAS® PERFECT PORTIONS™ MEATY SELECTIONS® is formulated to meet the nutritional levels established by the AAFCO Cat Food Nutrient Profiles for growth and maintenance. 1170 kcal ME/kg 45 kcal ME/ serving"